Broadway, extending across almost the entire city, is not only an important street for walking, living, shopping and work but is also one of Vancouver’s busiest transit corridors. How can we make it better? Broadway is the second highest concentration of jobs in the region. There is a distinct change in the nature of the street at Arbutus divide. East of Arbutus traffic flows are heavier – 30,000 at Cambie (Knight is 40,000) six lanes wide – and Broadway is also the only continuous truck route north of 41st. There is heavy transit use 100,000 passengers per day which is similar to the Canada Line and double the Millennium Line. He also noted that the expectations of Canada Line use were quickly exceeded. There is a significant amount of demand for transit that cannot currently be expressed due to capacity constraints of the system. Eats of Arbutus it is a long way to cross the street and there are only limited opportunities for amenities such as public art or street seating. West of Arbutus, Broadway is very different. There are awnings over the sidewalk and it is seen to be a place to have your business. There are the same number of transit trips but only 20 to 25,000 vehicle trips per day. In recent years the number of cars entering the city declined 5% (downtown 20%). In the past 15 years of growth has been accommodated on walk, bike and cycle, and New York is similar. We have been able to support a rate of economic growth that could not otherwise have been accommodated by automobile. On Central Broadway the mode split is more similar to the rest of the region. 21% of trips are on transit but improvements to transit are the most essential as there are currently more than 2,000 pass-ups at peak hour. If we had the same mode split on Broadway as downtown the automobile volumes would fall. It would then be entirely doable to have parking on street, with bus bulges, sidewalk widening and all the rest. Rapid Transit would make that possible – and make it a better street. Lance Berelowitz – is currently working for the City as a consultant to update policies for the Central Broadway area. He read from the City’s Terms of Reference for his work and it mentions Great Street, a vibrant public realm, and community consultation later this year. the study has a 30 year horizon and a policy decision is expected in 2012. Broadway is both extraordinary and very vexing. It is unique: it is the only continuous east west route across the City and into Burnaby (where it is called Lougheed Highway) and is wider at 99′ than most arterials (not the 66′ typical of Vancouver). It is the pre-eminent east west corridor, with significant buildings along it and its intersections with all the north south routes are important nodes. The opportunity of rapid transit of some kind is that it will “take the heat off an over-subscribed piece of real estate”. What Broadway might look like with rapid transit is currently what Translink is studying. “If you get rapid transit underground, you no longer need the B Line.” Therefore it is possible to re-engineer the street to attract more people, and better buildings. Public realm is underwhelming. Its lack of attraction stems from the absence of street trees. 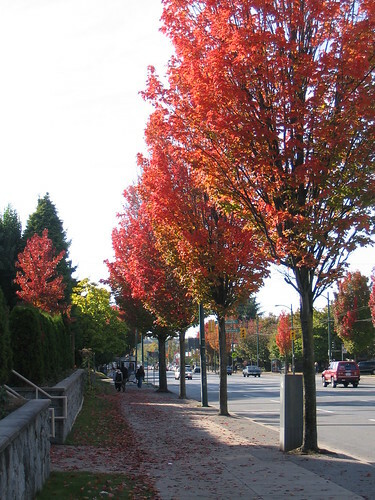 The linden trees in Kitsilano west of MacDonald, saved by public protest shows that substantial trees can survive on Broadway . The built form is spotty at best. The buildings are old and tired and many are only 1 or 2 stories high. This is simply not high enough relative to the great width of the street. We can take more lessons from you than you can learn from us – you are doing so well. “They talk about Great Streets but they never give any damn dimensions.” We measure streets: for instance – how far is it between doorways? On Queen Street in Toronto they are 16′ apart. We also count people as well as cars. Broadway is many streets over its length – but it is not a great walking street. Ultimately we believe it will be the main street of the city. There are some common physical and designable characteristics of great streets. The first is that they are places where people to walk with some leisure – a street in Rome, Queen St TO, Robson St, Davie St were all given as examples. On Strøget in Copenhagen they counted a pedestrian flow of 16 people per metre per minute. The greatest flow is found on Avenida Florida in Buenos Aires at 24 – which is probably the maximum. They noted also that people were strolling back and forth – they were not necessarily travelling through the street, but enjoying it. The best streets are comfortable: he showed a picture of a street in San Francisco where the wind [vortex] created by tall buildings blew people over. We need physical comfort – shade when its hot, sun when its cool – and that is the role of [deciduous] trees. There are many competing interests: success is when no-one gets everything but everyone gets a lot, and the public realm serves all interests. She illustrated this by showing the various Amsterdam transport networks. One example was the IJBurg “linear tramway district”. They chose not to give vehicles priority. She showed a Paris shopping street with mixed traffic where pedestrians outnumber cars. There are movable bollards that only residents and local businesses can open – and they drive at walking pace. The new cycle track on Hornby Street achieves the dame thing with hardscape. There are a few aesthetic issues but it is a great idea and safer than an on- street bike lane. San Francisco is reducing lane widths, and removing parking and turning pavement into parks. They have created street parks in former parking places. Because they were deemed temporary they were easy to do: then they become permanent as people show they like them and use them. In The Castro there are curved streetcar tracks through a park taken from the street – the curve limits the speed of the streetcars in any event. In its current state its is “snaggle tooth, haphazard, trees don’t add up to anything, too narrow sidewalks”. It is a bad pedestrian realm overall but some bus stops have been made better with wider sidewalks due to greater set backs of the buildings. Q: Why don’t we build cheap housing for students at UBC to reduce need for travel? Q: Bikes – helmet rule – Copenhagen and Amsterdam don’t need them. There was further discussion after 9pm – hopefully some of those who stayed might fill that in as comments. Gordon Price was asking about trucks as I left. My reaction was that while we looked at a lot of places that have either been well designed or managed to develop as civilised places (i.e. they kept the cars under control and allowed people to use the pubic realm) there was not much that emerged about what could or should happen on Broadway, simply because the rapid transit question remains unresolved. While writing this I learned that the Evergreen Line has been put off once again. And, of course, that is the first priority for rapid transit in this region. Vancouver is quite right to point out how bad things are on Broadway. The problem that I see is that it is much worse everywhere else in the region, and we are currently busy pointing fingers between levels of government. Having totally hobbled municipal government, the province has the chutzpah to blame them for every delay. And all the talk about new sources of revenue seems to be just that. Talk, not action. The last time I heard talk of Great Streets here, the context was No 3 Road. There, the overhead ALRT guideway seems to guarantee failure. Though the height limit on buildings doesn’t help. It is still a place I avoid as much as possible. Something I learned when I came to Richmond, and has yet to be disproved. You certainly do not see anyone walking at some leisure there! A couple of things that I think need to be pointed out. As the second paragraph makes clear we are only looking at this mode because it seems to be cheap. Cities are indeed “cash strapped” – but they need not be, and that is only a reflection of some very short sighted and deeply regressive taxation policies that seem to have taken over western society in general. There is still plenty of tax payer’s money available for things our present political leadership deems worthwhile, like fighter jets, or massive prisons. BRT should save money on upfront costs of equipment and infrastructure, but much depends on the degree of separation required. Ottawa spent a fortune on a grade separated right of way – but cheaped out in downtown, where buses were forced back into mixed traffic with entirely predictable impacts on service speeds and reliability.They also operated buses on conventional streets to do collection and delivery in the suburbs to give a one seat ride and no forced transfers – which tended to compensate for that. Ottawa started looking at LRT some years ago: “the city plans to replace some portions of its BRT with an underground light-rail line to serve the downtown core”. 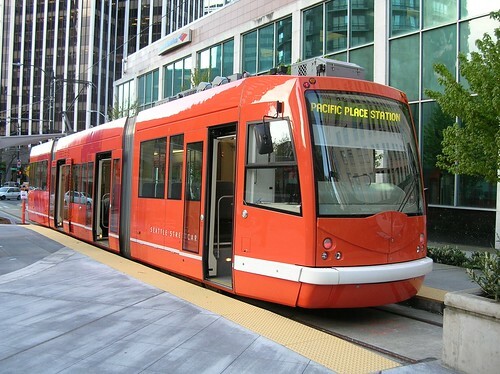 In Vancouver, in 2006, a decision was made to replace the highly successful, five-year-old bus corridor in Richmond with LRT, in order to have greater capacity. “Highly successful” seems to me to be debatable. It was chosen originally by an NDP government in Victoria and there was more than a little political spite involved. 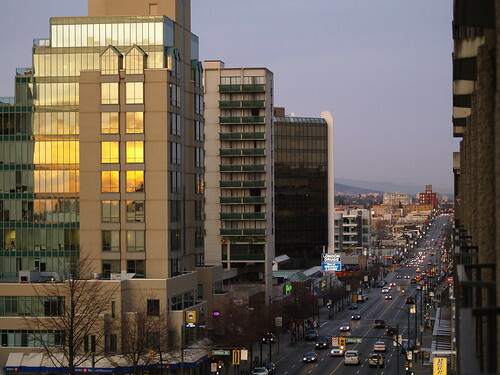 The former government had been planning LRT for Richmond – which is where the Vancouver commitment to the Cambie Heritage Boulevard came from. The NPA did not want surface running LRT. Glen Clark was happy to commit a very limited sum ($25m if my memory serves) to a bus service since Richmond would NOT get rail as long as he had anything to do with it. I will confess I did not hear him say that in person – but those at BC Transit in charge were given very definite marching orders. 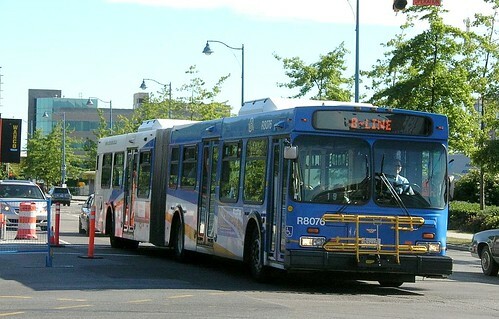 In the process of negotiation with City of Vancouver engineers, BRT was soon whittled down to a bus that did not stop as frequently as regular buses but would allow Vancouver passengers to board. (At that time, suburban buses sped past Vancouver stops as they were limited to suburban riders.) Only in Richmond was there any exclusive right of way and that was limited to a very short section of No 3 Road – which was supposed to be convertible to light rail in the future. When it was launched as the 98 BLine the overloading with passengers travelling to and from Marpole avoiding their slow trolleybus service – and the Richmond passengers lost to the forced transfer – meant that “express buses” came back very soon afterwards. As for capacity on the Canada Line (which I find it hard to think of as LRT) I have exhausted that subject in other posts. 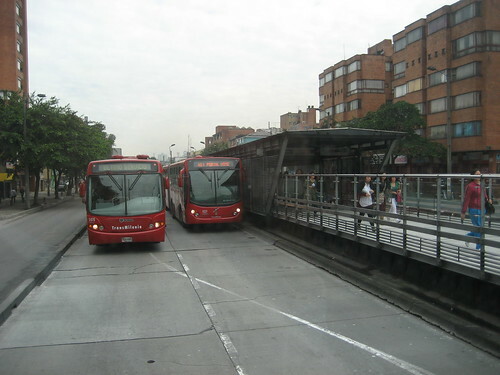 There are as many kinds of BRT as there are LRT – and a very wide variety of experiences to draw upon. Much depends on local circumstances and conventions. Not too many places, outside of South America, have double articulated high floor buses on exclusive rights of way with pre-payment at raised stations (Curitiba). The nearest we have to BRT now is the 99 B Line and that is overwhelmed when UBC is in session and gets little in the way of bus priority anywhere. It seems to me that the critical indicator that the Globe does not mention is relative speed. Relative, that is, to cars. As long as people can drive and park then the overall journey time door to door is likely to be faster and more convenient in a single occupant vehicle than most types of transit. That is because the car takes you almost door to door, whereas transit takes you from somewhere where you are not to where you do not really want to be. Now when the car driver faces congestion and a lack of parking spaces then transit starts to look attractive. Given the access and egress inconvenience of transit (i.e. walk time to and from the station at each end) anything that can be done to improve in vehicle time compared to driving is going to produce benefits in transit share of the market. But in Vancouver, the most that has been done with bus is to improve bus in vehicle time to be about the same as the car just by stopping less frequently. Though in the City of Vancouver even that gets reduced due to the City’s insistence on frequent stops for the B line. By giving transit its own right of way, the transit vehicle (bus, tram or train) moves faster than the car. That is all the “rapid” that is needed – and in some cases of short trips, the passion we have for grade separation means that access times – getting up or down to the platform – offsets the speed advantage. One of the great things about surface rapid transit is that access times are minimized – and the right of way can be taken from car/sov street capacity. I say “can be” only because in North America in general – and in Greater Vancouver in particular – it usually isn’t. 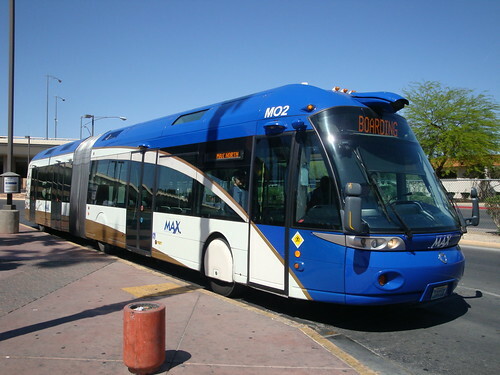 Bus lanes or HOV lanes are usually added not subtracted from GP capacity. The great lesson from Copenhagen – which I also never tire of repeating- is that space for cars must be steadily reduced over time. We can never ever keep up with the demand for car trips by adding capacity. It is pointless trying. When subways replaced streetcars on Yonge Street in Toronto, traffic downtown increased. Traffic expands to fill the space available. It is this that matters – not what sort of wheels the transit has. As long as we use BRT or LRT to try and accommodate insatiable demand for car trips, then we are doomed to exist in uncivilized places. Once we start thinking of cities as places for people – not their cars – then we start making progress. This is very good news indeed. The coverage of the new regulations at the time they were brought in, and subsequently, seem to be negative. There was a lot of uncertainty about how much you could drink safely – so most people, it was suggested, stopped going out and restaurants were hit hard. There was, it was conceded, the impact of the HST might also have had something to do with that. The campaigners at Mothers Against Drunk Driving have shown how effective a pressure group can be – and ought to be pleased with these results. On the same day George Monbiot deals with the related UK story of photo-radar – or “speed cameras” as they are called there. The experiment is over and the results are in. In April, Thames Valley police switched Oxfordshire’s speed cameras back on. They had been off for eight months, as a result of the government’s decision to cut the road safety grant. Then the police began assessing the damage. In the 31 days before the cameras were switched off (July 2010), the machines caught 2,286 speeding motorists. In the 30 days after they were switched back on, they caught 5,917. In the eight months without cameras, there were 18 deaths on the roads in Oxfordshire, compared with 12 in the same period in the previous year. This was the first time in four years that the number of deaths on the county’s roads had risen. Serious injuries rose from 160 to 179.
journalists and others have promulgated a powerful and dangerous myth: that speed cameras are useless, and exist only to tax the public. We now have a new premier who has promised change. I would like to suggest that rather than attacking ICBC (which has been providing good value car insurance, and profits, and has pioneered road safety features like modern roundabouts) she turn her attention to speeding and the toll that has on road users. For speed and collision severity are not just strongly correlated, we also understand the physics of collisions. The greater the speed, the greater the energy that has to be absorbed in a collision, and the greater the damage to people who are not inside steel cages. On drinking and driving “… there are 23 people in British Columbia that are alive today because of the new policies and new penalties,” Penner said in Victoria late Thursday.” I wonder what the story would be if the same attention were paid to excess speed. I think that speeding is an offence that occurs far more often than drink driving – because nearly everybody seems to do it most of the time. And nearly all of it goes undetected, simply because we do not have anything like the resources to deal with it. I find the method of enforcement of our drink driving law oppressive: everyone passing a road check gets stopped and questioned. There is no presumption of innocence and now much less “due process” but we seem to have accepted that the saving of lives justifies this intrusion on our right to go about our business without interference until suspicion falls on us. Unlike speeding, there is no lobby that actually suggests that drink driving should be encouraged – though there are plenty of people who have – they say – taken an economic hit due to stricter laws and tighter enforcement. But most drivers believe that they are better than average, and that the design speed of roads (and, of course cars) is much higher than the posted speed. Indeed, on the Sea to Sky Highway – and the Patullo Bridge, come to that – it was not that the road was inherently dangerous, but that drivers refused to obey the posted speed limit no matter what the conditions. My suspicion is that if we used the current red light cameras to photograph speeders as well – something they can easily do – we would see a significant change in behaviour. Most obvious the current belief that “green means go, yellow means go faster”. Fixed cameras at the highest collision sites would be the next step – and average speed cameras on sections of road that have no intersections – bridges would be my first choice. The Oak Street bridge has a posted speed of 60 km/hr. Most drivers treat it as part of the freeway (it isn’t) and excess speed across it is common. Indeed, once released from the line up prior to 70th and Oak, the green light southbound there seems to be seen as a starting gun. Average speed cameras do not use radar: we use similar equipment here all the time to measure flows through intersections by comparing license plates on vehicles entering and leaving an intersection. The same technology using two cameras at a known distance apart and synchronized to the same time produces incontrovertible evidence that the vehicle covered it at excessive speed. The only argument, of course, is who was driving it at the time. 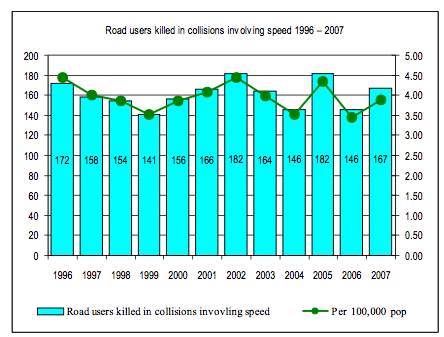 The latest data from ICBC is 2007 “The number and rate of deaths in speed-related collisions has fluctuated over the RSV 2010 period with no clear trend in more recent years. However, the increasing trend observed from 1999 to 2002 has not continued.” I cannot help but feel that trend might have had something to do with the ending of photo radar. My reading of that is that 160 people died in collisions “involving speed” . In that same year alcohol was the cause of 120 deaths. It seems to me that there is a greater case for effective speed enforcement on this statistic alone. Although maybe I should talk to Vicky Gabereau about why the statistics page at the ICBC website seems to be so far out of date. Seattle Viaducts, a set on Flickr. The Seattle Post Intelligencer this morning released the first images of what the waterfront could look like once this monstrosity has been taken down. The fact that most of the currently abandoned Waterfront Streetcar remains intact and useable is a sign of hope. In fact, if this track were doubled and modern streetcars or light rail were used, the number of people that it could move would be double that of each level of the viaduct. 4 lanes of expressway = 9,000 pphpd (2,000 vehicle per lane per hour at average 1.25 occupancy). The proposal of course does not include that. Indeed, the current idea is to build a tunnel to replace the viaduct. If you take a look at the Google satellite view below, it is clear that there is in fact a great deal of available space – but most of it is taken up now by roadways and parking. Vehicles are great space wasters. In San Francisco, along the Embarcadero, removing the freeway actually increased vehicle capacity – and the new F line streetcar tracks added even more people moving ability. I am relieved to see that the Seattle idea is mainly about Waterfront open space. 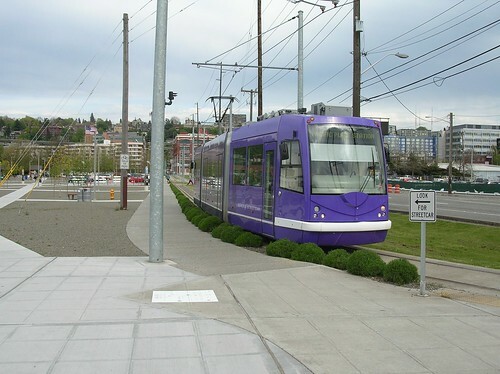 Unfortunately, the current example of the Lake Union waterfront (which does incorporate a street car) does not fill me with hope. Corner, whose most recent, high-profile project is lower Manhattan’s popular High Line elevated park, said ultimately a successful, post-viaduct waterfront would have to accommodate many disparate groups. so perhaps my fears are ungrounded. … tonight [Thursday May 19, 2011] TransLink announced that they could not find agreement on how to build the United Boulevard Extension (UBE) through New Westminster and they will not be recommending to the Councils of New Westminster and Coquitlam that they can proceed with this project. The planners have been asked “to put their pencils down”. Further it was pointed out that the entire North Fraser Perimeter Road (NFPR) through New Westminster is not a priority as declared by the Mayor’s council which directs TransLink. (This was not news, but reiterated that there was never a priority to do anything about the rest of the road system in the City even if the UBE was built). I would like to say that TransLink, their consultants and staff carried out the most detailed series of consultations that I have ever participated in and it seems that, in the end, they did listen to the community. Further the community deserves a lot of credit for coming together and articulating the issues and making TransLink aware that the projects they favoured would not solve the traffic issues they sought to address. From a sustainable transportation perspective it is perhaps encouraging to note that many have recognized that its not easy, if not impossible, to solve traffic congestion problems in New Westminster by simply building more roads. The issue is not finished. The traffic problems still exist at Braid and Brunette, as well as air quality and rat running problems in Sapperton. The industrial area is still overrun with traffic, making the busineses there less viable. We do need to keep talking about solutions to these issues, but at least we now have the opportunity to start to talk about other ways to allow people and goods to move through our community without destroying the quality of life, or simply making things worse. The City can now move forward with its Master Transportation Plan to establish a vision how transportation in our City should evolve, meeting both local and regional needs. I hope everyone will be part of this process and to explore the variety of options which have been implemented around the world to deal with transportation congestion in urban areas. Let’s make this our “Vancouver moment” and create the change in transportation thinking which is so needed in our City and region. Thanks to everyone who participated in the community workshops, and wrote letters or emails to TransLink, the City, and the local papers. The foregoing paragraphs have been lightly edited for clarity. I would add that it has long been recognized that building roads in urban areas can never solve traffic problems. Induced traffic always results in continuing congestion. Only reducing road capacity and our reliance on personal automobiles has ever lead to traffic reduction and less congestion. This as true in New Westminster as any other urban area. It is perhaps unfortunate that Translink does not recognize this truth and continues to pursue road network expansion projects such as the proposed 6 lane Patullo Bridge. On the other hand at least they backed down: unlike the province which continues with its destructive South Fraser Perimeter Road and threatens to issue injunctions against those who try to draw attention to its folly. There is a web page for this book but it does not appear to be working properly. 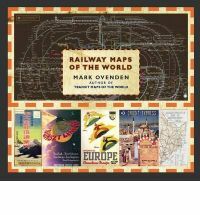 The author, Mark Ovenden and the publisher, Viking Books both have more information on their web pages. He also has a blog. Naturally. I was offered – and requested – a review copy, and it is one that I will not just keep but consult. My first reaction on opening it was that I would need a magnifying glass. The hardback book is 11¼” x 9¾” – which is sizeable if not exactly coffee table size. In fact I was pleased initially since I have too many such books – most on railway topics – and the bookcase will clearly not accommodate another. The shelf is sagging as it is. And some of these maps seem likely to exist online as they are the current passenger system maps. For every country in the world that has a passenger service. It is the historic ones that interest me most, and I think that most were originally designed as large posters. Being a convenient size means the book is easier to handle and reasonably priced. Though as usual we Canadians are charged a higher price than those people a little to the south. (US $35 Canada $40.50) You probably have your own views on cross border shopping so I am not going to open up that here. I am also going to ask for his other books if anyone asks me what I want for Christmas. I will start with “Transit Maps of the World” and wait a bit longer for “Paris Underground”. Unless, of course, someone wants to send me review copies of those too. Even at the size on this page, the amount of information and the way it is conveyed is striking. It is not just the maps either. There are lots of illustrations and well conveyed ideas in text too. Since he had to cover the whole world in this project, some places get a bit less than I would like, but sometimes his choices are uncanny. For instance he has the line diagram put out by the LMS railway when they took over the London Tilbury and Southend line. That includes the links that were then in place so that through trains could run from the Circle Line to Southend! As a small boy I thought that was a splendid idea. Once the underground was electrified that sort of thing became rarer and ceased altogether by the time of nationalisation. I think everyone who has any interest at all in the subject matter of this blog will find much to absorb them. There is quite a lot about how the railways shaped development – both urban and rural. Specific attention is paid to areas such as the Canadian prairies and Los Angeles. But I am equally sure that many people will be tracing rides they have taken and would one day like to take. 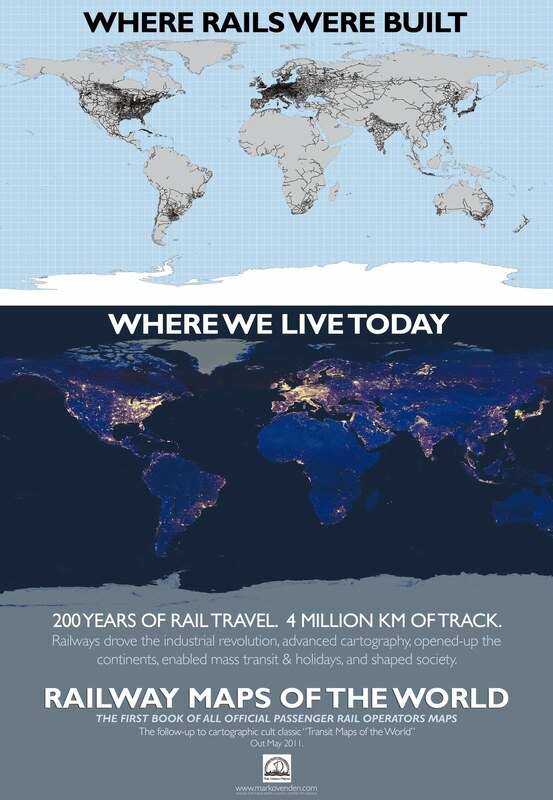 The decline of railways in places like Canada, the US and Argentina (mind you they did go a bit overboard originally) is strongly contrasted to what is happening in Japan, China and other more forward thinking nations. Sad, of course, are the countries not mentioned simply because they do not have any passenger trains at all. You should buy this book if you are at all interested in railways, or how transportation affects the way we live or if you are interested in design and cartography. Actually I think everyone gets caught up in maps – being “put on the map” is still a concern (almost as much as the indication “you are here’) but undoubtedly important is the way that maps deceive us – sometimes intentionally. In fact many railway maps were produced to persuade the traveller to take one route in preference to others (crossing from Dunkerque to Tilbury was a lot longer than Calais to Dover, for example, but don’t expect the marketing department to tell you that). “Metro Maps of The World” was published in November 2003 and sold out its first run in a matter of weeks. In September 2005 Mark moved to France to focus on his next book about the Paris Metro. Meantime his original publication was picked up by a Dutch Publisher (‘Metrokaarten van der wereld” 2006) and also by Penguin in the USA. The American version, “Transit Maps of The World” was published October 2007. Media coverage was phenomenal and led to unexpectedly high sales, and a Top 100 ranking in the Amazon Sales Charts where it is still often the number one best-selling book in it’s category (Mass Transit)! I suspect that this book will equal that performance, so it might be a good idea not to wait around too long if you want to get your hands on a copy. And (before you ask) no, this is one book that I am not going to lend anyone!